best international level, and to create a highly visible entry in biodiversity issues at world scale. Proposing solutions to societal problems, especially with regard to the consequences of global change on ecological services, by transferring results from research, i.e contributing to conservation biology sensu lato. 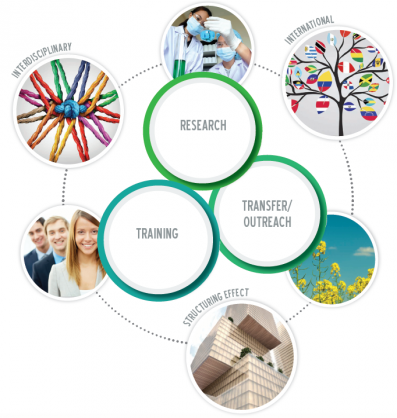 activities in research, training and transfer / outreach (see Table PR1). The general idea of Cemeb project is to favor excellence and the emergence of new science fronts, the development of new technologies and tools, to strengthen international collaborations, to foster links and collaborations between research and the non-academic world (stakeholders and citizens) to speed up the transfer of research results, and to the train students, research staff and biodiversity managers of tomorrow. Developing research programs combining theoretical approaches, observations (including long-term ones in structured observatories) and experimental work. All these approaches are increasingly based on high-throughput and high-tech methods and fast-evolving data management calling for high-level technical competence, technological watch, and collaborative perspective. In practice, these lines are developed through working tools and activities in research, transfer and training. 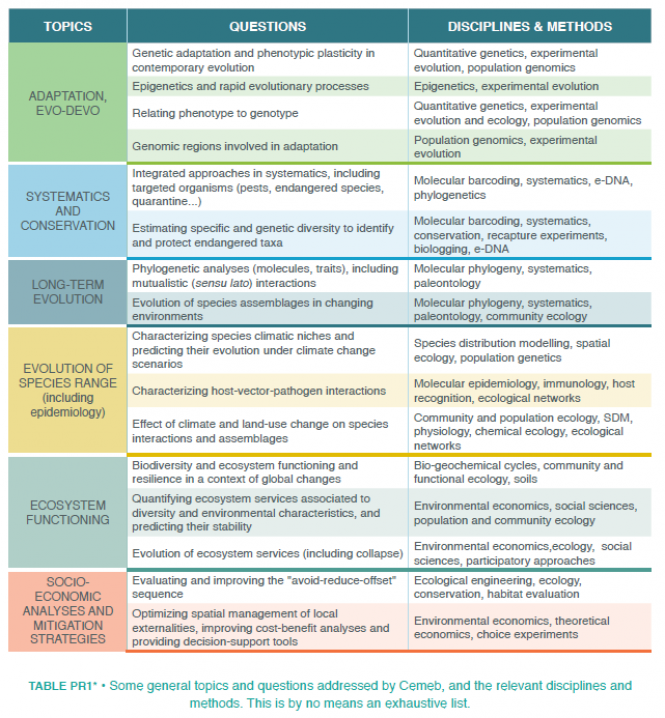 Interdisciplinary topics are tackled both internally (Cemeb hosts scientists from different disciplines) and externally, especially with other Labex in Montpellier and the Maison des Sciences de l’Homme (human and social sciences topics). ‘International’ is a key word in all activities, with an emphasis on human mobility. research units and with other academic partners in an interdisciplinary perspective. Overall, the idea is to create a single, highly visible entry for all partners with regard to biodiversity issues, and to become a top player at world scale and the main European entry for Southern countries.